A growing medical device manufacturer has gotten a shot in the arm and finalized a lease for a new Hampton Roads research park, where more tenants and buildings are in the works. IvWatch LLC recently raised $12.3 million toward a $16 million goal, according to a March filing with the Securities and Exchange Commission. 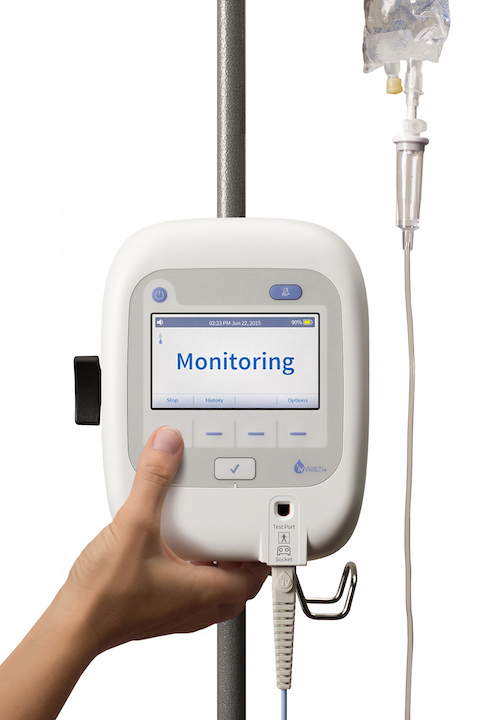 The company makes and sells a device called the ivWatch Model 400 that can detect when liquids leak outside of the vein during intravenous (IV) therapy. The medical device detects leaks through a small sensor about the size of a pencil eraser that sticks to the patient’s skin near an IV site. Its manufacturer’s suggested retail price (MSRP) is $3,695. Gary Warren, ivWatch’s president and CEO, says the company is in expansion mode as it prepares to upgrade its facilities. IvWatch LLC made official on Monday a seven-year lease for a 25,500-square-foot space at Building One of the Tech Center Research Park in Newport News. The company last year had signed a letter of intent for the space. IvWatch is consolidating its headquarters and operations from facilities in Hampton and Williamsburg into the Newport News space. Warren says the new space will allow ivWatch to bring some of its specialized, proprietary manufacturing processes inhouse. Around $5 million worth of equipment is going into the new facility. Most of ivWatch’s roughly 40 employees will be based out of the Newport News site. The company has plans to continue adding employees. Warren says customer growth has put ivWatch in expansion mode after forming in 2010. He would not disclose sales figures or number of units sold. Warren says ivWatch’s customers include some of the top children’s hospitals around the country. He says the company has begun growing its export business with a distribution deals for Japan, Australia, New Zealand and Qatar. Around 40% of ivWatch’s business is domestic. IvWatch got its original FDA clearance in 2016. It has received regulatory approvals in Canada and Australia and is working on getting them for Japan. Warren says ivWatch also is eyeing tapping into the adult critical care market after having focused on children’s hospitals. Warren says medical device makers have faced a slower sales cycle in a post-Theranos world. The sales cycle is the time between when a company makes contact with a potential customer and that customer agrees to make a purchase. Before the blood testing company Theranos crumbled beneath reports it was duping investors and regulators, medical devices typically had a sales cycle of three to four months, Warren says. Now, with potential customers wary of being scammed, the sales cycle for medical devices is 12 to 18 months, Warren says. Most potential customers want to evaluate medical devices before the buy to make sure everything checks out. “You can’t fake it ‘till you make it anymore,” Warren says. IvWatch plans to begin moving into the 80,000-square-foot building around the same time construction on the building wraps up in two weeks. The company will have manufacturing space on the first floor of the building, and the third floor will be used for research, development and administration. Tech Center is a massive development in Newport News composed of retail, residential and research spaces at the corner of Oyster Point Road and Jefferson Avenue. The retail section is about 285,000 square feet and includes a Whole Foods. The residential portion comprises 288 units. Newport News-based W.M. Jordan Co. is a joint venture developer on the project with Georgia-based S. J. Collins Enterprises. W.M. Jordan executive chairman John Lawson is chairman of the Board at ivWatch. Tech Center Research Park is planned to have 10 buildings that range between 80,000 and 100,000 square feet. The research buildings will have three and four stories. The first building had been planned for completion at the end of last year but weather caused delays, says Jeff Johnson, the park’s director. Johnson says the first building is almost completely leased with 4,600 square feet still available. He would not say what other tenants plan to join ivWatch at the property. An anchor tenant already has signed on for the second building, which is scheduled to begin construction in the fall of 2020. The goal for each research building is to have half of one building leased before starting construction on a new one. “We want to be market driven,” Johnson says. Clarification: This story's headline has been updated to reflect the status of the company's fundraising.